3 Cheeses + Crackers Custom Gift Box for sale. Buy online at Zingerman's Mail Order. Gourmet Gifts. Food Gifts. Create your own ultimate cheese tray with three cheeses of your own selection. Use the menu below to choose your favorites from across the US and around the globe. 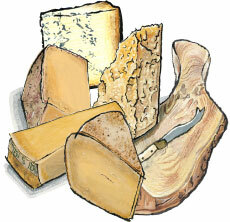 We'll head to our cheese cave, cut and wrap your cheese to order, and pack them with a box of artisan crackers. Each piece weighs in at at least half a pound, for just over a pound and a half of cheese total.